Hi I'm Blake, I'm from New Zealand and I started my kitchen career at Cellier le Brun, Marlborough, New Zealand, before working in some of New Zealand’s top establishments, like the Yacht Club Resort in Picton, New Zealand, the Crowne Plaza Christchurch and at Bracu Restaurant in Auckland. I later moved on to Australia, and worked at Rock Restaurant in Hunter and Pier Restaurant Rose Bay Sydney, 2 and 3-hatted restaurants. After a stint as Sous chef at Lizard Island, I headed for Bali to join Chef James Ephraim in Mozaic Restaurant's kitchen. I've been working here as sous-chef for over three years and have been in charge of this cooking class since the very beginning of my term. I've been recently promoted to Head chef, but still continue to run the classes as teaching and passing my knowledge to others is a passion. 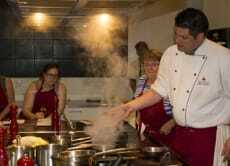 It's great fun to teach people how easy it is to cook great meals. My classes focus on the usage of Asian ingredients in western cuisine, so when you return home, you can still apply the same techniques you learn with me to cook great meals. I will also tell you how to replace some ingredients if you cannot find them back home! Come join me!